We want to celebrate the fact that we now have reached 922 fish recipes (yes!) 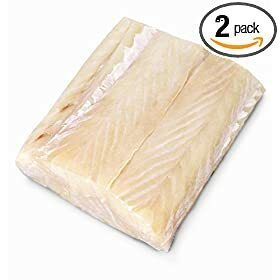 on Recipes.it (link) with these two essential way to cook cod, one from the past and one from today's kitchens - both tasty and easy. Freshen 1 pt. 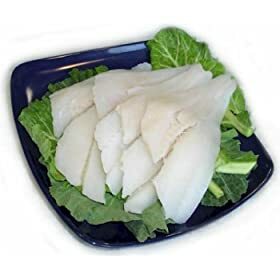 of salt codfish, add to it 1 qt. chopped, boiled potatoes, mix well, cut three slices of salt pork in very small pieces and fry brown; remove half the pork and add the fish and potatoes to the remainder; let it stand and steam five minutes without stirring; be careful not to let it burn; then add 1/3 cup of milk, and stir ell. Put the remainder of the pork around the edge of the pan, and a little butter over it; simmer slowly for 1/2 an hour, until a brown crust is formed, then turn on a platter and serve. Pour red and green peppers sauces onto a serving platter from opposite ends, so they meet in the middle. Place grilled cod over the sauce, and serve immediately. Ten times more durable than traditional nonstick, these jellyroll pans have an Ifalon nonstick finish that resists chips and peeling. Thick, reinforced rolled edges and folded corners prevent warping. Made from corrosion-resistant aluminized steel for superior heat conductivity and durability. Includes three jellyroll pans in small, medium and large sizes for every baking project. Perfect for sponge cakes, cookie bars, roasting vegetables and toasting nuts. Dishwasher and oven safe to 550°F. A toast to our toast!